I change recipes all the time. Substitute this, omit that, double the other thing… But here is one recipe I didn’t change at all. For one thing, there’s not much to change! For another, it has such rave reviews on the blogs on which I found it, that I wanted to give it an unadorned trial run. 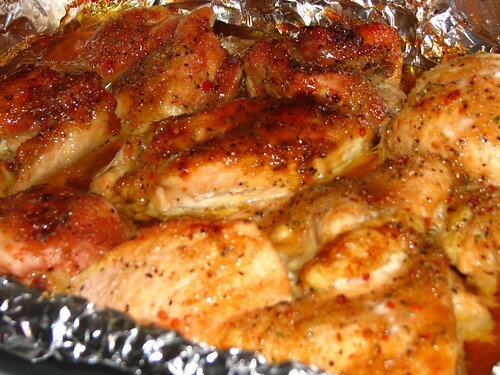 Place chicken in a single layer in a greased 9×13 baking dish. [I lined mine with non-stick aluminum foil and sprayed it with cooking spray.] In a small bowl, combine dry salad dressing mix and brown sugar; sprinkle over chicken. Bake, uncovered, @ 350* for 55-60 minutes or until juices run clear. 4 servings. It was very good. Everyone liked it and wants to have it again. So there’s another recipe for my binder. Gonna need a new recipe binder any day now. I’ve already made two…one for general recipes and one for desserts. Wonder which way I should go with a new one. Maybe main dishes? And all the sides, beverages, snacks, etc. in the original one? I’ll have to ponder that. 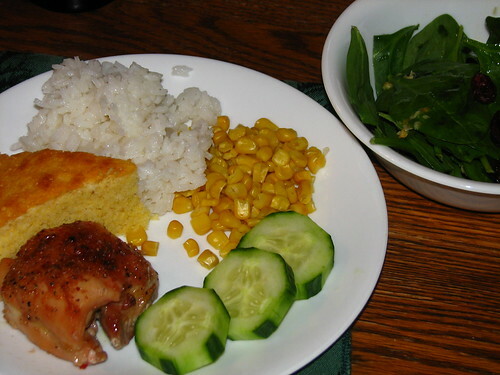 This entry was written by ~~Rhonda, posted on January 28, 2010 at 11:34 pm, filed under Recipes. Bookmark the permalink. Follow any comments here with the RSS feed for this post. Post a comment or leave a trackback: Trackback URL. Yummm! Sounds and looks great! I’m going to make your chicken tortellini soup this weekend – have leftover chicken, just have to pick up some tortellini on the way home from work. Haven’t visited much lately …really must change that. You have WAY too many wonderful posts to miss any of them! Rhonda! We made the chicken this weekend and everyone loved it! (They even went back for more!) It will definitely be added to the rotation! Thanks for posting it!